The Graduate School has established a research body called the 'Hall of Global Environmental Research', an educational body called the 'School of Global Environmental Studies', and a supporting body for education and research called the 'Grove of Universal Learning'. This organization includes three types of faculty: permanent professors, professors on double appointments, and collaborating professors. Double-appointment professors teach and conduct research both at their home schools, institutes or the various research centers of Kyoto University, and at the Graduate School. They hold professorships at two institutions within Kyoto University for a limited term. Collaborating professors are professors who teach and conduct their research not only at the institution within Kyoto University to which they have been appointed, but also at the Graduate School. These three types of faculty, together with visiting professors, explore global environmental issues and develop advanced technologies related to global environmental problems. Predicated on the desire to achieve global benefits, ecological conservation and recycling of natural resources, the Hall of Global Environmental Research is composed of three research groups, the departments of Global Ecology, Technology and Ecology, and Natural Resources. In the global society of the 21st century, human socio-economic activities and the natural environment are closely interdependent, and international relationships regarding science and technology, economic development and environmental preservation are strengthening. 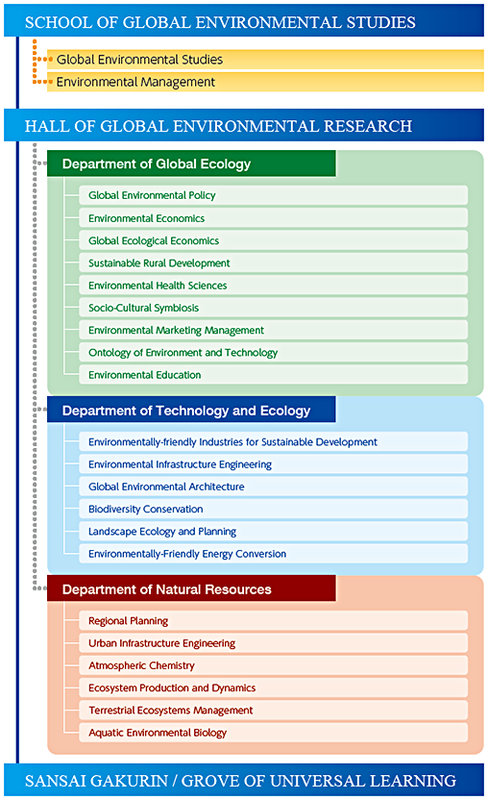 With these trends in mind, the department of Global Ecology seeks to firmly establish a scientific contribution by (1) studying the framework of human and environmental symbiosis, (2) integrating existing natural and social science disciplines into the new discipline of global ecology, (3) developing policies and techniques that go beyond national interests and international economic interests and serve global common interests, and (4) conducting studies which can contribute to governance that can enlarge the management capability for the global environment. A delicate balance between nature and humanity has emerged as a global system being interacted between nature and human culture. Without sustaining the balance, human culture as well as human life cannot be maintained. To establish global environmental studies as a fundamental science of human existence, we try to integrate environmentally-friendly technologies across disciplines and develop technologies and technological criteria well-suited to an environmentally balanced civilization. The Department of Natural Resources considers the global ecosystem to be a complex composed of nature and human society and seeks to avoid environmental destruction by conducting dynamic analyses of resource circulation on both a global scale and within regional ecosystems. Our research and educational approaches are, therefore, built on both global and regional perspectives, based on the idea that natural resource management must conform with a well-designed human lifestyle on a local scale that, in turn, contributes to the conservation of the larger ecosystem and ultimately that of the global environment. Topics that receive particular attention include the environmentfriendly utilization of organic resources, technologies for low-impact material conversion and recycling, and the proper management of land and water resources. Field-based studies of geospheres, biospheres, coastal zones and watersheds also play a key role in identifying resource circulation issues in such regional units and suggesting solutions for sustainable development and environmental conservation that can be carried out on both a local and a global scale. The School of Global Environmental Studies is composed of the “Doctoral Program in Global Environmental Studies,” designed to foster outstanding researchers responsible for further development of the new field of global environmental studies, and the “Master’s Program in Environmental Management” and “Doctoral Program in Environmental Management,” both designed to train outstanding practitioners capable of addressing environmental issues from the local to the global level. The educational goals of these programs are shown in the following table. This program fosters researchers capable of working at the international level by tackling global and local environmental issues using innovative approaches and methodologies drawn from various fundamental academic fields. This program trains internationally-minded practitioners with the knowledge and practical skills required to tackle environmental problems from the local to the global level. This program also fosters researchers capable of working at the international level by addressing global and local environmental issues using approaches and methodologies drawn from various fundamental academic fields. This program fosters practitioners with advanced management expertise and the extensive knowledge and skills required to address environmental issues from the local to the global level. This will enable them to make a practical contribution when working in international settings. Students participating in any of the above programs may enroll in both compulsory and elective courses offered in English, in keeping with the Graduate School’s aim to train professionals capable of working in an international setting. Students seeking to further their interdisciplinary knowledge base are also able to take credited lecture courses from other schools in Kyoto University. Sansai Gakurin was established in 2002 to promote and support the activities of the new Graduate School of Global Environmental Studies (GSGES) at Kyoto University by facilitating the exchange of ideas across relevant disciplines, both inside and outside the university. “Sansai” refers to the traditional East Asian triad of heaven, earth and humanity that embraces the phenomenal world. “Gakurin” means a “grove of scholars.” The 2001 mission statement of Kyoto University promulgated its intention to pursue harmonious coexistence within the human and ecological community on this planet. To broaden knowledge of global environmental studies at Kyoto University, Sansai Gakurin holds regular events such as the ‘Kyoto University Forum (global environmental forum)’ and the ‘Hannari Kyoto Shimadaijuku’ (each three times a year), and organizes lecture/discussion gatherings by faculty open to all students and faculty. In addition, Sansai Gakurin co-organizes public international seminars and forums related to the Graduate School of Global Environmental Studies (GSGES), and collaborates with organizations within Kyoto city to engage the public over environmental concerns. Sansai Gakurin supports innovative medium- and long-term research by the GSGES faculty to integrate the research activities from diverse fields and support achieving a more harmonious balance of man and nature. Sansai Gakurin also regularly publishes the Sansai Newsletter to promote GSGES activities. Sansai Gakurin supports various ongoing international education programs by GSGES faculty.